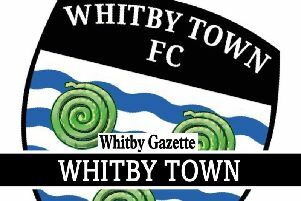 A pair of local footballers have been invited to join in Whitby Town for pre-season training. Elliot Anderson and James Organ-Simpson impressed manager Chris Hardy when the Blues held an open trial on Saturday afternoon. “Elliot and James were quite clearly the pick of the lads who turned out at the trial,” Hardy said. “Elliot is very good technically, and at just 16 years of age, he has time on his side. James was extremely lively and certainly seems to know where the back of the net is. “It will be very interesting to see how they respond to the environment of being around and playing with the first team squad. Central-midfielder Anderson and winger Organ-Simpson, 23, were among just four of the players who attended the trial to be invited back for pre-season. Former Hartlepool United youngsters, James Dawson and Lewis McDonald, both goalkeepers, also caught Hardy’s eye, but the Town boss said that unearthing some local talent is an added bonus. “It’s pleasing that we’ve found some lads from the town who we think might be good enough to be involved,” he added. “This is Whitby’s football club and we want to extend the opportunity for local lads to play for their town. Caedmon College Whitby student Anderson was a regular starter for North Yorkshire under-16s in 2015/16 and has spent time as an academy player with both Doncaster Rovers and York City in the past. “I enjoyed the trial and Lee Bullock’s coaching and it went very well,” he said. Organ-Simpson, starred for Teesside League outfit Fishburn Park last season and said that he was “buzzing” to have been asked to train with the Blues. “I just want to get my head down and justify it now,” he added. Both players will link up with Hardy and the rest of the squad tonight (Tuesday) as the Seasiders hold their first training session of the summer.